It turns out that CSS Grid is pretty good at laying out online comics, especially if you want your comics to be flexible. 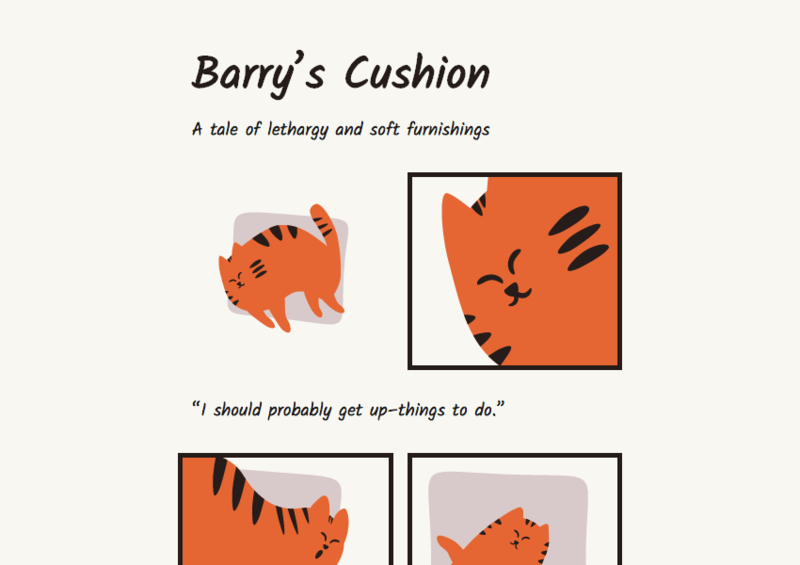 In this tutorial we’ll use Barry the cat to demonstrate how to build a responsive comic. 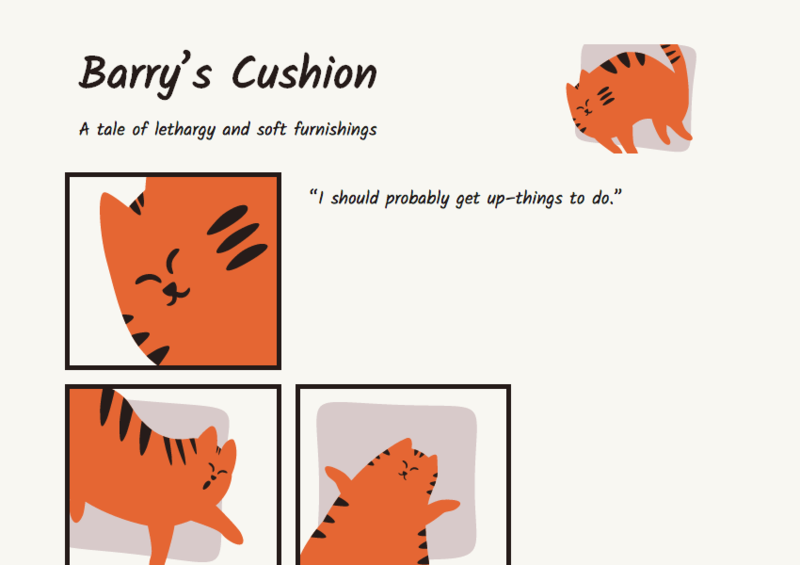 For this tutorial I’ve borrowed some artwork from GraphicRiver; Sleepy Fat Cat is actually a display typeface, but comes packed with some lovely cat vectors–perfect for this comic demo! Check out the full demo on CodePen to see it respond to different screen sizes. Here we have a <section> to act as our grid, with a load of <div class="panel"> elements to be our grid items. A couple of panels have text in them, but the rest will be for our comic images. We have two options here: we can either place our images inline within the panels, or add images through CSS. I’m doing the latter because it affords easier control over the placement and sizing of the graphics, but you could argue that inline images would be more accessible. Your choice. Looking back to our earlier Grid tutorials you’ll recall that grid-template-columns assigns how many columns we’ll have, and how wide they’ll be. grid-template-rows does the same for rows; here we’re defining eleven of them. The ones containing images will be 200px high, the ones with text will size automatically according to the content. Finally, grid-gap defines our gutter size. The background properties don’t have any visual impact just yet, but they will just as soon as we add some background images. And the box-shadow acts as a border. You can also use traditional border properties here if you prefer, but box-shadow sometimes gives more flexibility. Let’s see what we have so far! But I don’t want borders around all the panels. I’ll remove them (using box-shadow: none;) from those containing text, along with the first image, and the final image. We’ll use them to alter the grid layout in each case. We’re going for two columns and eight rows for slightly larger screens, then three columns and five rows for even larger. Our two column layout looks great! However, our three column comic needs fixing. As we’re working mobile first, the rules we applied to our first media query are still taking effect on the largest of screens. We need to work our way through the panels and reset some styles. Here, we’ve positioned both .panel-7 and .panel-8 to grid-column: 1; and grid-row: 4;. That means that they’re both in exactly the same place, with whichever appears second in the DOM being stacked on top of the first. Note: now that we’ve effectively removed a row, you’ll need to check your grid-template-rows are ok.
Well done–here’s what we’ve built! This was a fun exercise in using CSS Grid, whilst introducing you to some new Grid concepts along the way. I hope you enjoyed it–now if you don’t mind I’m off for a nap. Learn how to use 3D graphics in your web design projects in our new short course, Three.js: Beyond the Basics.